ACI Motors contributed specialised cleaning machine to Cox’s Bazar beach management body to enhance green activities in the tourist city. ACI Motors Managing Director and Chief Executive Dr. F H Ansary and Executive Director Subrata Ranjan Das joint handed over the machine to the authorities concerned at Hotel Sea Palace in Cox’s Bazar on Wednesday, according to a handout. 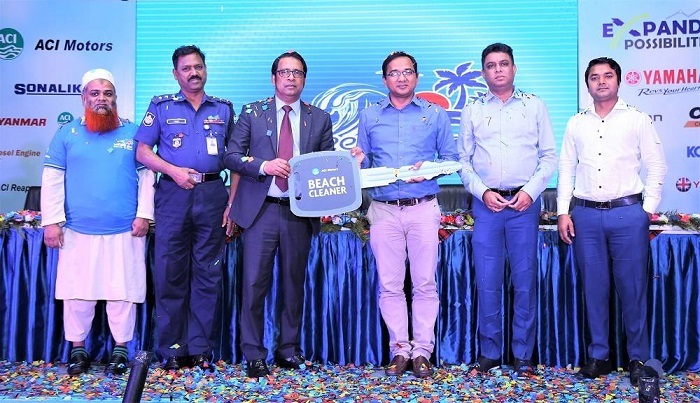 ACI Motors has taken the initiative as corporate social responsibilities(CSR) in a bid to support the green activities for longest beach in the world, according to the officials. This type of machine is to be used for the first time in Bangladesh; as well as in this sub-continent. ACI Motors has gifted a 90 horsepower Sonalika branded tractor with beach cleaner attachment for this purpose. Sonalika is the leading tractor brand in Bangladesh and the gifted tractor has features like 4 wheel drive and air conditioned cabin; which is perfect for operation in the beach. Also, ACI Motors has got a unique proposition of within 6 hours after sales service commitment anywhere in the country.